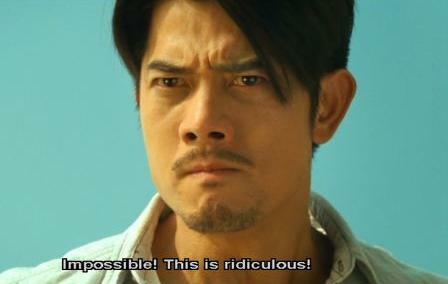 Aaron Kwok’s reaction to Murderer’s script. Murderer is the kind of film that makes me both relish and regret my position as a movie reviewer. For those of you who’ve seen this turkey of a film, “relish” might be an easy reaction to understand, thinking that I would love, love, love to mock this movie. But “regret”? Maybe you’d think I mean that in terms of regretting to have to sit through it, but that’s not what I mean by “regret” at all. While I recognize some films are work-for-hire/totally commercial enterprises, I would hope that most movies are labors of love for the filmmakers involved. Why dedicate a good chunk of your life to something you don’t feel strongly about? Why even bother? A quick glance at the “Making of” Featurette included on the Murderer DVD confirms that director Roy Chow (not to be confused with Rey Chow), writer Christine To, and two-time Golden Horse winner Aaron Kwok devoted countless hours to preparing for this movie. And after all that hard work, here I come — the snobby film critic — ready to pan their precious creation into oblivion. To tell you the truth, I actually don’t like being in that position. Writing reviews is sometimes difficult, but negative movie reviews are probably some of the easiest reviews to write, as it’s fairly easy to list all the ways you didn’t like a given film. But with that “passion” there’s also the potential to be just plain catty or unnecessarily personal in a review, and I really try to avoid that. I haven’t been perfect; there are plenty of reviews where I’m just a little too snarky, but otherwise, I do try my best to stick to the film at hand. When Wind and Cloud unite…you’re in deep $#!t. Hi, I’m Calvin McMillin, and I like Storm Riders. Now, of course, my lack of even the most fundamental Chinese reading skills puts me at a disadvantage when it comes to truly immersing myself in the world that Ma Wing-Shing created in his beautifully illustrated comic books, but that hasn’t stopped me from being a fan of the franchise. Still, I’m pretty familiar with the early story arcs since I own almost the entire run of the English language translation of the comic book published by the now defunct company, Comics One (those graphic novel reviews should be coming sometime around 2046). During my trips overseas, I’ve bought several Storm Riders artbooks, desk tchoktkes, and a pretty badass poster of Nameless that I keep threatening to hang up against my girlfriend’s wishes. And I would be remiss if I didn’t mention my bad habit of collecting those little Storm Riders figurines that come out every so often. And of course, I own both Andrew Lau’s initial Storm Riders film as well as Dante Lam’s animated “sequel” Storm Rider: Clash of Evils. Heck, I even introduced the original film at a student-run film festival back at my alma mater, Oklahoma State University (in hindsight, we should have shown Shaolin Soccer instead, but I digress). 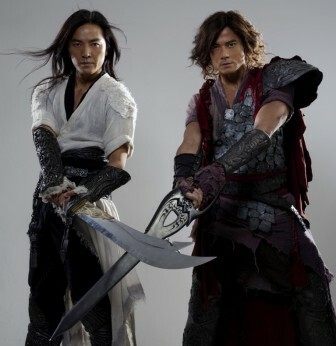 In tribute to James Cameron’s new film, Sanjuro employs Lee Byung-Hun as his official LoveHKFilm.com Avatar. Well, I’ve finally made it to Singapore, so it’s time for a blog update. During my stay I’ve already seen the Laughing Gor prequel, TURNING POINT, and I hope to see OVERHEARD eventually as well as the Singaporean film WHERE GOT GHOST? perhaps as early as today. I also finally got the opportunity to watch Pixar’s UP, which is hands-down the best movie of the summer.